Dollar ended last week as the strongest ones, mainly due to weakness elsewhere. Worries of global slowdown, or even recession, sent Germany and Japanese stocks sharply lower. Global treasury yields also tumbled on safe haven demand. Adding to that, renewed concern over re-escalation of US-China trade war also weighed down on sentiments. Yen and Swiss Franc followed as the next strongest. Commodity currencies ended as the weakest ones with Australian Dollar leading the way after RBA put rate cut back onto the table. 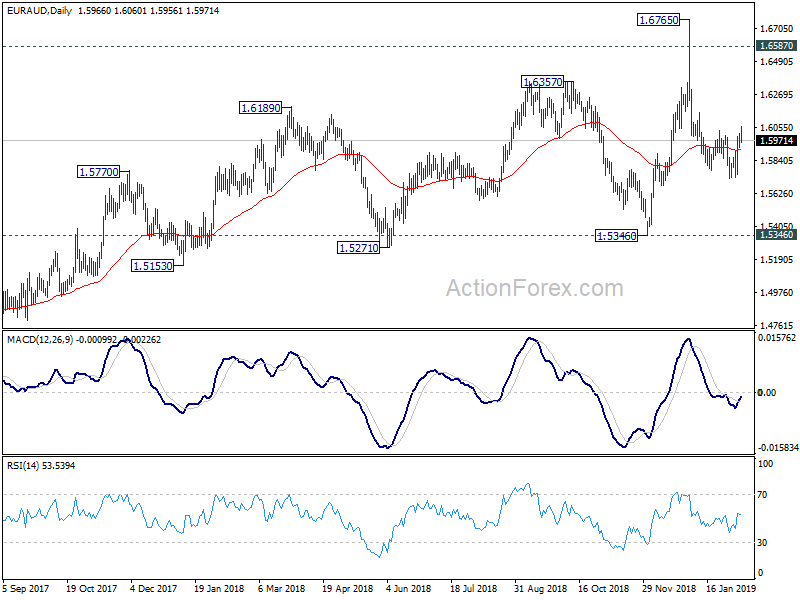 New Zealand Dollar was pressured by job data miss. Canadian Dollar was helped by strong job data but the impact of offset as oil price gyrated lower. Euro and Sterling were not much better. In particular, slowdown in Eurozone seems to be more serious that expected after EU’s steep growth outlook downgrade. Looking ahead, never-ending Brexit and US-China trade talks will remain the focus. In addition, GDP from UK, Japan, Germany and Eurozone will be particularly watched to gauge the condition of the economy. Concerns over re-escalation of US-China trade war resurfaced last week after Trump said he won’t meet Chinese President Xi Jinping this month to seal the trade deal. That raised some worries that the US will go ahead and increase tariffs on USD 200B in Chinese imports from 10% to 25% on March 2, after trade truce deadline. If it happens, there will be additional pressure on the already slowing US economy, as well as the even worse slowdown in other countries globally. For now, we won’t turn pessimistic on the situation yet. Firstly, trade talks are going to resume this week. And Trump’s comments might just be a negotiation tactic. Lower-level officials will kick off meetings in Beijing on Monday, on the US side led by Deputy Trade Representative Jeffrey Gerrish. Later on Thursday and Friday, high level talks will be carried out involving USTR Robert Lighthzer, Treasury Secretary Steven Mnuchin, and Chines Vice Premier Liu He. Things would then be really worrying if there is no breakthrough regarding intellectual property theft, forced technology transfer, State owned enterprises, and enforcement of agreement. For now, the situation the talks are not at that bad stage yet. Secondly, Trump will meet North Korean leader Kim Jong-un in Vietnam on February 27/8. It’s easy for him to travel next door to China if the time is ripe for doing so. Thirdly, they can always extend trade truce beyond March 1. While US stocks tumbled on Thursday, major indices staged a rebound on Friday to close the week nearly flat. The development argues that investors were indeed not too worried about trade war yet. DOW has started losing momentum as seen in mild bearish divergence in 4 hour MACD. From pure technical point of view, further rise is expected as long as 24323.94 support holds. But as rise from 21712.53 extends, we’d expect DOW to continue to lose momentum as it approaches 78.6% retracement of 26951.81 to 21712.53 at 25830.60. Positive news on trade talk might push DOW through 25830.60 before topping. But negative developments would likely send it through 24323.94 support, which indicates near term reversal. 10 year-yield lost 2.7 handle again last week and closed at 2.632. The main reason for the decline should be free fall in yields in other major markets, like German and Japan, on worry of slowdown and even recession. We’d maintained that TNX is now close to critical support level. That is, 38.2% retracement of 1.336 to 3.248 at 2.517, which is close to long term channel support too. However, the failure to break 55 week EMA with the weak recovery is somewhat bearish. And sustained break of 2.517 will mark medium term reversal, which will be rather worrying. Dollar index rebounded strongly last week. The greenback was also the strongest one, mainly thanks to weakness of the others. 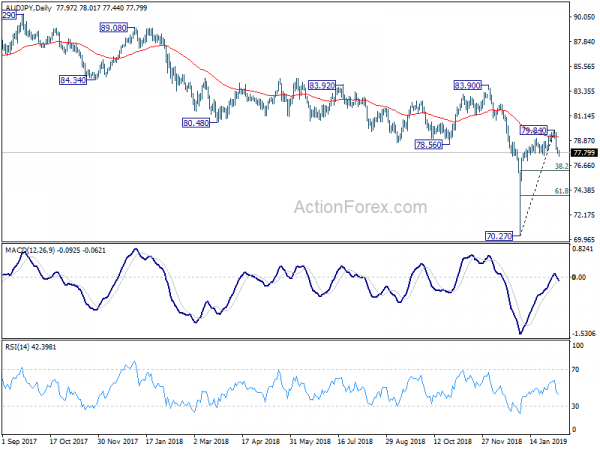 For now, Dollar index is seen as extending the consolidation pattern from 97.71. While further rise could be seen in the near term, we don’t expect a break of 97.71 high yet, at least not before EUR/USD breaks 1.1289 support decisively. Meanwhile, in case of another fall, we’d expect strong support from 93.81/94.09 support zone (38.2% retracement of 88.25 to 97.71 at 94.09) to bring rebound. Some might argue that the sharp fall in Nikkei was a result of trade war threat. But judging from the mild reactions in Hong Kong HSI and US stocks, we’d again see the decline as result of recession worry instead. Nikkei’s steep decline now argues that rebound from 18948.58 has completed at 20981.23. That came just ahead of 55 day EMA as well as 38.2% retracement of 24448.07 to 18948.58, after breaching 20971.73. Deeper decline is now in favor back to retest 18948.58 low. Indeed, current development suggests that fall from 24448.07 is now finished yet . Economic projections for EU, UK and Australia were downgraded last week. Let’s recap with EU first. European Commission projected EU growth to continue for the seventh year in a row in 2019, with expansion in all member states. But the pace of growth is expected to slow further as “economic momentum at the start of this year was subdued.” Indeed, GDP growth for 2019 was quite sharply downgraded. The downgrade was clearly reflected in German DAX. The development bears some similarity to Nikkei. Last week’s powerful decline suggests that rebound from 10279.20 has completed at 11371.74 already, just ahead of 38.2% retracement of 13204.31 to 10279.20 at 11396.59. Deeper fall is now in favor in near term to retest 10279.20. The current development argues that down trend from 13596.89 is not finished yet and could make another low. The decline in 10-year bund yield was even more serious. It closed at 0.09, down from 0.17, and hit the lowest level since late 2017. There are talks that it’s heading back to negative region. Australian Dollar was sold of sharply after RBA’s balanced sheet. In short, the central bank now judges that the chances of a hike as next rate move or a cut are evenly balanced. Growth forecasts were lowered in the new economic projection. More importantly, RBA projected a slower pickup in inflation and slower decline in unemployment rate. That is, the central bank is further away from a hike, even if the next move is a hike. 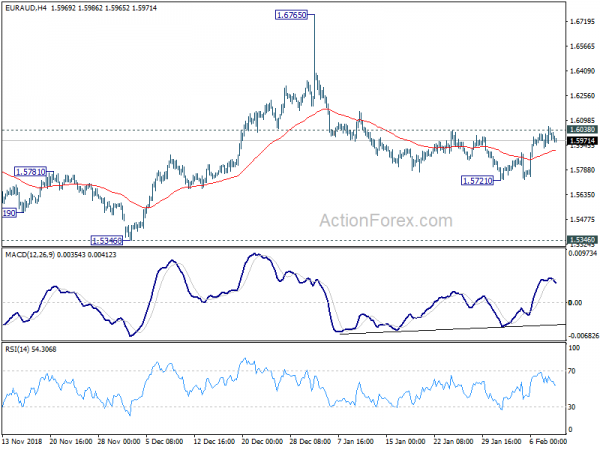 Our USD/CHF long order was not filled and cancelled last week as updated here. Looking ahead, we’d expect more downside in Japanese stocks as well as global treasury yields. Positive outcome from US-China trade talks might provide temporary boost. But over sentiments will remain weak on recession worries. Negative outcome will make the situation worse. Thus, risks are skewed to the downside. With such background, we’ll try to sell a Yen cross. Dollar is avoided for its own resilience. Canadian Dollar was just lifted by better than expected job data. Sterling is avoided due to Brexit uncertainty. That leaves us Euro and Aussie as candidates. 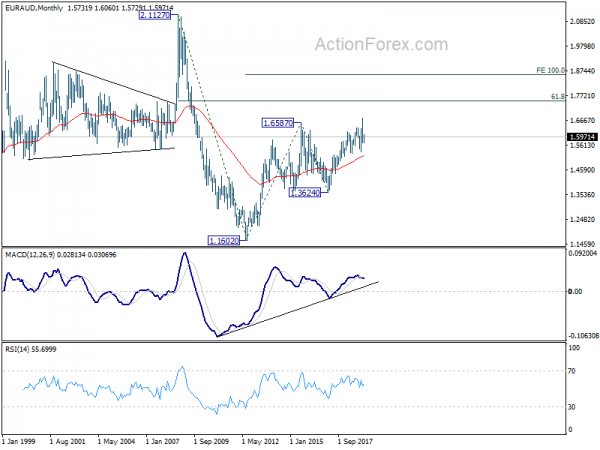 Technically, breach of 1.6038 minor resistance suggest near term bullish reversal in EUR/AUD. Thus, Aussie seems to be the weaker one. AUD/JPY’s rebound from 70.27 low is likely completed at 79.84, on bearish divergence in 4 hour MACD. This is supported by rejection from 55 day EMA. Daily MACD also crossed below signal line. 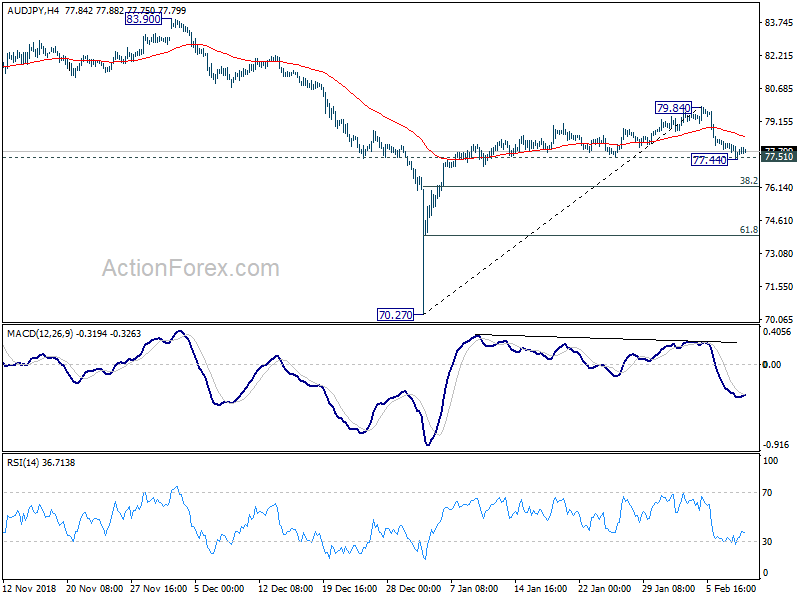 As AUD/JPY is drawing support from 77.51 support, we’d try to sell on recovery to 78.40, which is close to 4 hour 55 EMA. Stop is place at 79.84. As we don’t expect a break of 70.27 with the current fall, our target will be put at 61.8% retracement of 70.27 to 79.84 at 73.92. This gives risk-reward ratio at 1:3.1, which is acceptable. 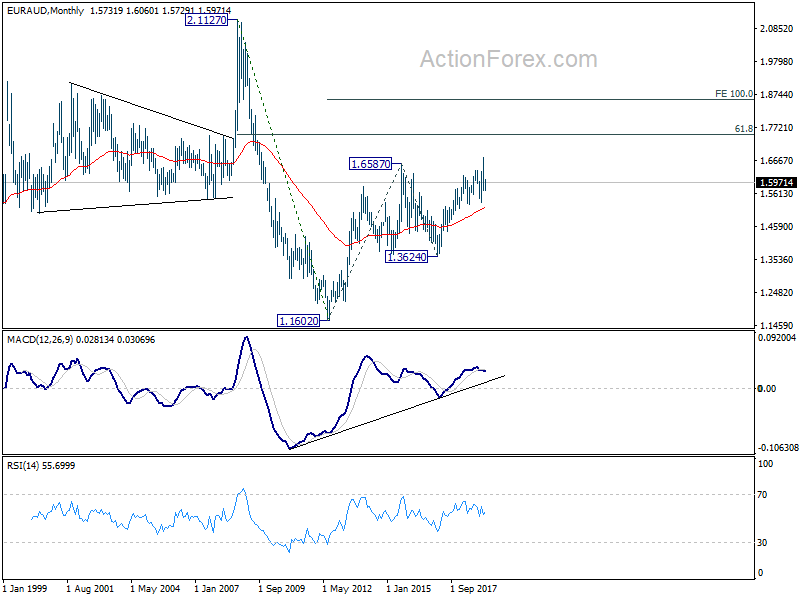 EUR/AUD rebounded strongly last week but failed to sustain above 1.6038 resistance retreated. Initial bias is neutral this week first. For now, we’d favor the case that decline from 1.6765 has completed at 1.5721 already, on bullish convergence condition in 4 hour MACD. Risk will stay on the upside s long as 1.5721 support holds. Decisive break of 1.6038 will confirm this bullish view and target a test on 1.6765 high. On the downside, break of 1.5721 will extend the decline to 1.5346 support instead. In the longer term picture, the rise from 1.1602 long term bottom (2012 low) is still in progress for 61.8% retracement of 2.1127 to 1.1602 at 1.7488. 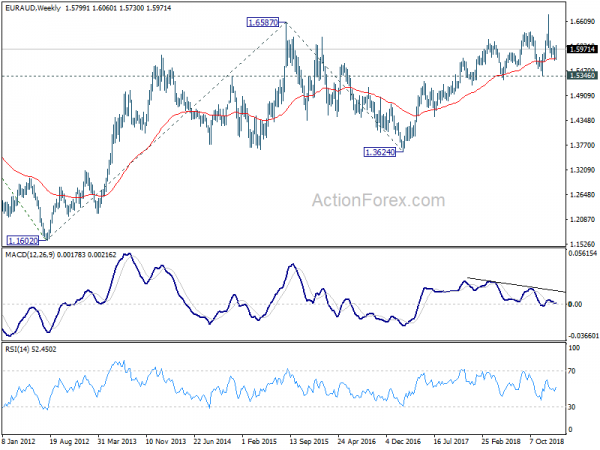 Firm break there will pave the way to 100% projection of 1.1602 to 1.6587 from 1.3624 at 1.8069. 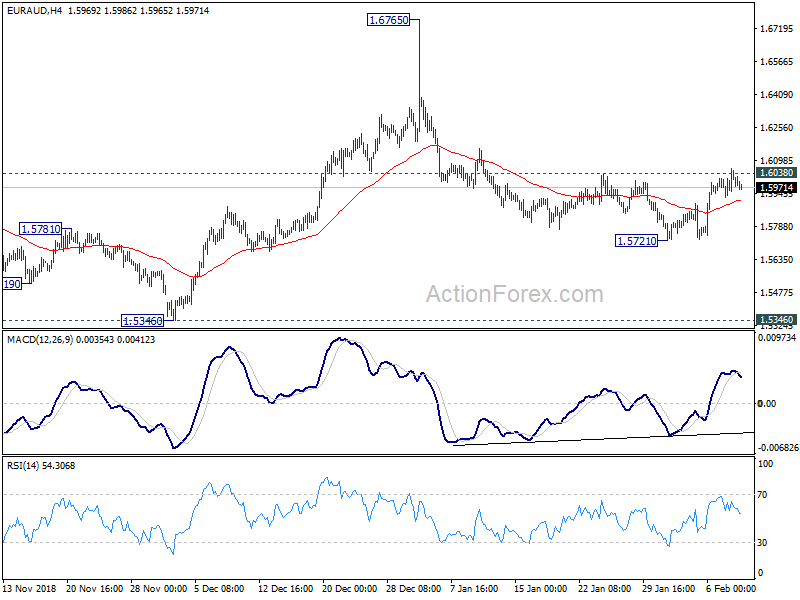 This will remain the favored case as long as 1.5346 remains intact.